Remember the commercial about the guy suspended from a steel girder by his hard hat held on only by Super Glue? Or was it Krazy Glue®? There was another with a car that was hung from a junkyard crane secured only by this fabulous new adhesive? As with many things, cyanoacrylates were discovered accidentally. The year was 1942 and Dr Harry Coover and Fred Joyner of Kodak Laboratories were doing research to develop a transparent plastic suitable for gun sights. Those experiments failed but a new product that could quickly bond together many different materials with great strength. Kodak continued to develop this new adhesive into a product which became known as Eastman 910. In the 60’s, Eastman Kodak began selling their formulation to The Loctite Corporation who developed their own branding and distributed it under the name Locktite Quick Set 404. In 1971 Loctite implemented its own manufacturing and introduced its own product under the name ‘Super Bonder’. By the late 70’s their market share is believed to have exceeded Kodak’s. Those TV commercials brought Cyanoacrylates or ‘CAs’ to the forefront and the attention of hobbyists and homeowners alike. However, not all cyanoacrylates are created the same. The Original SuperGlue® for example is 100% ethyl cyanoacrylate, one of several formulations that also including methyl-2 and ethyl-2 CA. n-butyl cyanoacrylate —used in veterinary and skin glues, and a related compound, 2-octyl cyanoacrylate which is a Medical Grade product. 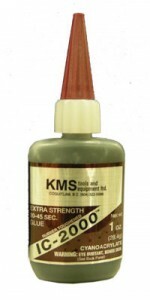 At KMS Tools and Equipment we have our own line of specially formulated CAs designed to cover a wide range of home, hobby and industrial bonding applications. Cyanoacrylates are reactive monomers, a compound that polymerizes, creating chemical links when pressed into a thin film. While the efficacy and performance of CA’s degrades or disappears with the presence of too much moisture, a very thin layer of water moisture that is present on most surfaces actually acts as an alkali or weak base, which is the catalyst required for bonding to occur. This is why even the driest of fingers can get firmly welded together. When used properly, CAs form a bond that is in many cases stronger than the materials being glued. As with all CA’s, the closer the parts fit together, the stringer the bond. Always hold the bonding surfaces together as tightly as possible and smooth out any rough spots. Although KMS Cyanoacrylates will hold objects together with considerable strength, the full bond strength will take several hours to achieve. An accelerator can be pre-applied to speed curing time but CAs allowed to dry and cure on their own are generally a little less brittle and have a higher net strength. 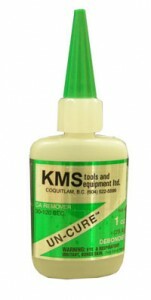 Although we provide a fresh product with a guaranteed two year shelf life, there are several things you can do to get the most from your KMS Cyanoacrylate Adhesives. Heat and moisture will decrease shelf life, so store your CAs away from accelerators and in a cool place that’s not exposed to direct sunlight. Unopened and well-sealed bottles can be stored in the fridge or freezer to maintain freshness. Make sure you let it warm to room temperature before you use it though. 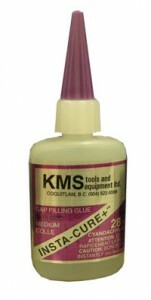 When you first open a bottle of KMS CA adhesive, loosen the cap and retighten to relieve any air pressure that might be inside. This will decrease the chance of any leaking out when you open the tip. Hold the bottle upright against a near vertical surface and cut off the top 1/32″ with a knife or razor blade. Avoid squeezing the bottle. To prevent clogging, don’t let the tip of the nozzle touch a surface that INSTA-SET™, our CA Accelerator has been applied to. Before replacing the cap, or squeezing it to blow air up to clear the nozzle, wrap the bottle down hard to move the CA remaining in the tip back down into the bottle. Now you can clear the tip and replace the cap. Here’s a rundown on our KMS Line of Cyanoacrylates. With a watery-thin viscosity that wicks deep into joints by capillary action, Insta-Cure™ dries in a matter of a few seconds. Surfaces to be bonded must be tight fitting and should be held together securely while Insta-Cure™ is applied around the edges of the seam. At the moment of curing, most CAs give off a vapour that can irritate the nose and eyes. And if you’ve never gotten the tiniest of splashes actually IN your eye, lets just say it’s worth wearing eye protection while using any cyanoacrylates! Having a higher, medium viscosity than its sibling, Insta-Cure+™ is perfect for applications with looser fitting joints in which the adhesive must bridge gaps and slight surface inconsistencies. Typically, Insta-Cure+™ is applied to one surface then the parts are held tightly together for 5 – 15 seconds. Insta-Cure+™ is also the perfect choice for bonding large surface areas with close joints, such as laminations. To prevent premature curing, lay down a serpentine bead with about 1″ separations on one surface, instead of spreading it out thinly, then assemble the parts, letting the pressure between materials spread the adhesive. When quick isn’t quick enough or for difficult to bond materials, Insta-Set™ is a catalyst that acts as an accelerator by enhancing alkaline conditions during the polymerization process to quickly cure even a thick layer of CA. Typically, Insta-Set™ in a pump spray bottle is used to cure the CA that flows from joints when they are pressed together. 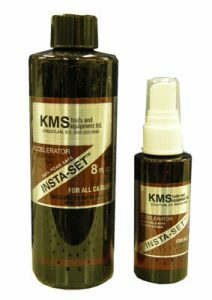 An additional bead of thick CA such as the much thicker KMS MAXI-SET™ can be applied along the seam and then cured with Insta-Set™ to significantly enhance a joint’s strength. An alternative, especially for difficult to bond materials, Insta-Set™ can be applied to one surface and the CA to the other. When brought together they will bond instantly. Formulated with a strawberry scent and with little degradation of the CA’s strength, Insta-Set™ activates in 6-8 seconds, is 100% foam safe and can be used on clear plastics. With an extra thick viscosity and an open working time of 10 – 25 seconds, Maxi-Cure™ is the best CA choice for most plastics including GE’s Lexan™. When used with Insta-Set™ it will fill most voids, can be carved with a file, hobby knife or razor blade and sanded to form a finish indistinguishable from plastic. Having a thick viscosity makes Maxi-Cure™ easier to work with than thinner CAs for most applications. It’s the best choice for plastic model assembly and bonds hardwood and plywood better than any other hobby adhesive. 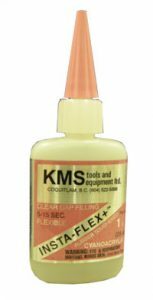 For gluing to inside, cloth textured surfaces of fiberglass, scrape or sand the area before using Maxi-Cure™ or any other adhesives. Plywoods should be lightly sanded before bonding. Through the addition of a rubber compound, IC-2000™ is a black coloured CA that forms shock resistant bonds on non-porous materials. This rubber-toughened cyanoacrylate has added flexibility making it perfect for bonding metals, fiberglass, rubber, carbon-fiber and other advanced materials. Ideal for model use, IC-2000™ bonds bulkheads, formers and servo-rails to the inside of fiberglass hulls and fuselages. Although it has an open working time of 20 – 40 seconds, it can be accelerated with Insta-Set™. When cured, IC-2000™ is pliable enough to be carved with a hobby knife and is the best adhesive for R/C car tires. If your parts are bonded incorrectly or you get those fingers stuck together, a few drops of Un-Cure™ quickly softens cured and hardened CA. Apply on bonded skin and slowly roll fingers apart. Don’t try and pull them apart, damage to your skin can occur. Once unstuck, use acetone to clean off softened CA then wash the cleaned areas with soap and water. Un-Cure™ can also be used to easily remove adhesive residue from price tags, and tape. Take care though, it can also remove paint from many surfaces. Also great for cleaning small paint brushes. Unlike most typical CAs, once cured, Insta-Flex™ does not turn brittle yet remains clear, even if accelerated with Insta-Set™. Not quite as thin as Insta-Cure™, this flexible CA still has good penetrating qualities and superior shock resistance, making it ideal for many applications. Drilling a 1/16″ hole in the center of a CA’ hinge slot is recommended to ensure complete saturation when installing CA hinges. Insta-Flex has also been proven superior when bonding anodized aluminum. While having similar qualities to our black, IC-2000™, Insta-Flex+™ is a rubber-toughened CA that is clear and can be used in applications where you want the flexibility of IC-2000™ without the adhesive being seen. Since the carbon component that makes IC-2000™ black —and contributes to its unsurpassed strength, has been removed, Insta-FLex+ has slightly less strength than IC-2000™, but still superior to standard CAs. Insta-Flex+ forms superior, flexible, esthetically pleasing bonds to soft urethane, and vinyl plastics. When a joint has a larger than normal gap, flexible CAs provide superior shock resistant bonds. An extremely thick cyanoacrylate paste, IC-GEL™ comes in an applicator tube, like toothpaste. Being a paste, IC-Gel™ can be used at any angle, including on horizontal overhead surfaces, and will stay in place without running. IC-Gel™ is an excellent putty for plastic models. It will fill any void, can be formed into many shapes and is easily sanded or filed. Applying Insta-Set™ allows IC-Gel™ to be worked in less than 20 seconds. With the added advantage of superior bonding to metal, IC-Gel™ is a perfect alternative for body work. 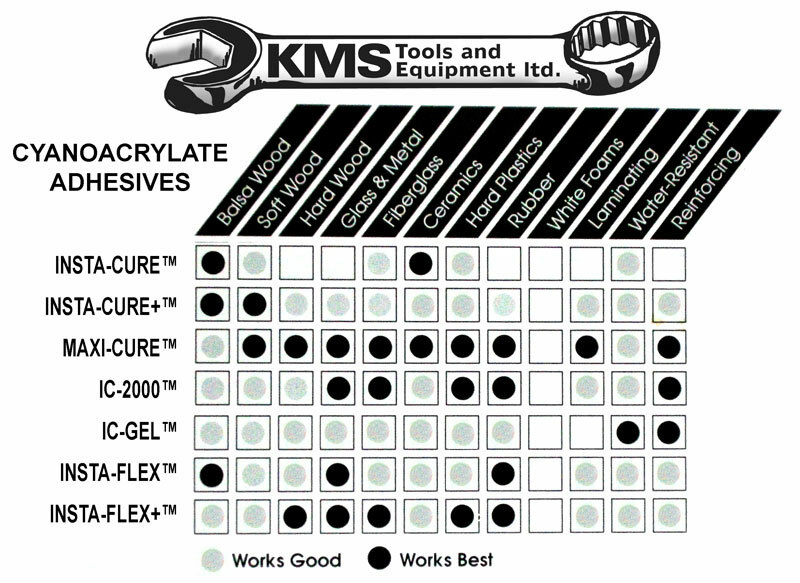 Use this handy chart to help you select the KMS Cyanoacrylate that’s best for your project or drop by any location and talk to our staff with any questions you might have. 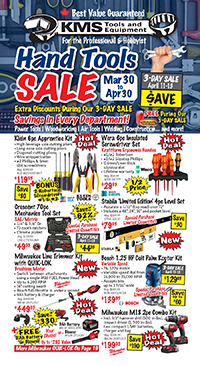 This entry was posted in Archives, Buying Guides, Woodworking by Gord Field. Bookmark the permalink.